I met John McDermott once. He was standing at the back of the press rows the night David Haye got beaten by Carl Thompson. An evening more notable for him because he saw Mark Krence flattened by an imported journeyman that looked likely to rule the boxing butcher out of their proposed Eliminator, a contest, John lamented, for which he’d already sold £10,000 of tickets. And that snatched conversation typifies the kind of circumstantial misfortune he has laboured under for his entire professional career. In his forthcoming rematch with Tyson Fury I have a growing suspicion the genial giant may yet have his moment in the sun and overcome that sense of never being in the right place at the right time once and for all. Speaking at the press conference yesterday, alongside promoter Frank Maloney, he had a different type of presence, perhaps it was the absence of his loquacious adversary Fury which permitted a sense of McDermott’s new resolve to emerge. He spoke of training with new intensity under the direction of Jim McDonnell, a trainer with the ability to muster discipline from the most errant of contenders, and of a falling body-fat percentage. The type of question few other fighters would be posed, particularly at heavyweight. John’s physiology has always been the Achilles heel to his marketability as a British heavyweight or as a television fighter. He’s a big bugger as old-fashioned parlance would go and a vision of muscular definition or aesthetic sculpture he most certainly isn’t. However, he can box, has faster hands than opponents tend to anticipate and has shown ruggedness in contests with Danny Williams and Fury which belied his capitulation to Matt Skelton some years ago. 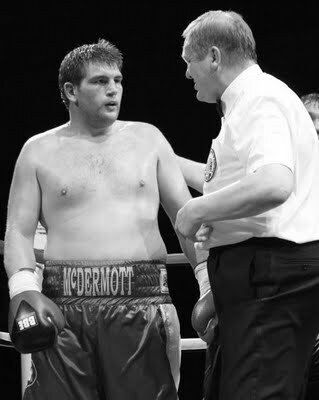 Qualities Fury hadn’t expected in the promotion to their first contest in which the 21 year old prospect referred to McDermott as McDonut. An unfortunate slur on John’s dedication of which he has plenty and was eager to assert yesterday. When asked about his preparation he stated he trained very hard for the previously suggested dates for the contest but was now in very good shape following 5 months with McDonnell a telling task-master. 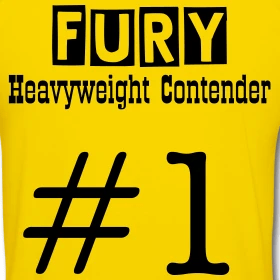 His class in describing Fury “as a really good fighter” who was simply “just not good enough at the moment” demonstrated an old-school respect for the sport which further paints him as the anti-dote to Fury’s frothy contention of being ready to beat world-class contenders already. In the video below from Frank Maloney’s website, John’s section is from around the 16 minute mark if you wish to make your own judgement on his sometimes fragile self-belief. Ultimately, their fight on the 25th June will provide some much need definition to John’s career, providing a likely full stop should he lose or a stepping stone to a British title fight with Derek Chisora. At least this time the fight will be judged by a trio of ringside officials, a new mandate from the British Boxing Board of Control for English title fights following the outcry referee Terry O’Conner’s verdict in favour of Fury the last time they met for this title caused. John’s intention to “put it on him from the start” suggests he’ll seek to leave them largely redundant on the 25th.